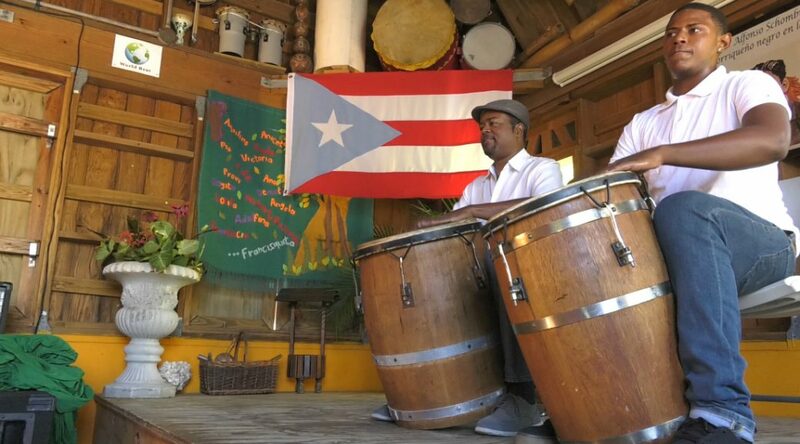 In the beachfront Puerto Rican community of Piñones, the vibrant music of bomba fills the breezy air, as duelling drummers beat in rhythmic unison. The sounds come from Corporación Piñones Se Integra, an organization that teaches locals and tourists the art of bomba as a way of passing on the music to future generations. One of Puerto Rico’s traditional Afro-Caribbean musical forms, bomba is considered a rhythmic dialogue between the dancers and the drummers. Puerto Ricans hope this musical dialogue will turn into actual dialogue that will be a key part in preserving the Afro-Puerto Rican culture. Maricruz Rivera, the founder of Corporación Piñones Se Integra, emphasized that this is especially important given the racial tensions both in Puerto Rico and in the states. Rivera said the bomba community is especially gaining prominence among young people, like the center’s 19-year-old drummer Luís Lace Melecio. This increase in the new generation of bomba enthusiasts has become evident in Chicago as well, according to Roberto Pérez, co-director of local bomba group Bomba Con Buya. He said that this is in part due to a growing consciousness of millennials about the importance of Puerto Rican identity and nationalism. Pérez estimates that there are three or four bomba groups in Chicago. He thinks this number may increase as more people become involved, which could result in a growing awareness of the musical form. “We think that not only can these traditions be forgotten, but they continue to be frowned upon and so we have to work to change that,” said Pérez. Bringing these Afro-Puerto Rican traditions to the Chicago community inspired Eravisto “Tito” Rodriguez to create AfriCaribe, a non-profit dedicated to celebrating the African influences in Puerto Rican heritage. Through hosting monthly bomba gatherings called “bombazos” at AfriCaribe Cultural Center in West Town and offering an academy to teach children the art of bomba, Rodriguez said he hopes education will inspire the next generation to continue to celebrate the culture. “It’s planting that seed and making sure we still have a Puerto Rican identity and a Puerto Rican culture that’s alive,” said Rodriguez.